11.23.18 21:37	Account	Receive	+5.00	Received Payment 5.00 USD from account U18384461 to account U4731311. Batch: 237079656. Memo: API Payment. 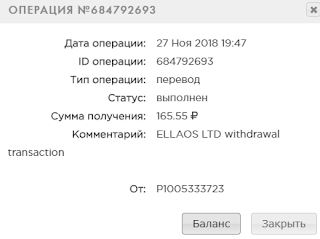 ELLAOS LTD withdrawal transaction. 11.24.18 19:42	Account	Receive	+5.00	Received Payment 5.00 USD from account U18384461 to account U4731311. Batch: 237172406. Memo: API Payment. ELLAOS LTD withdrawal transaction. 11.25.18 20:48	Account	Receive	+5.00	Received Payment 5.00 USD from account U18384461 to account U4731311. Batch: 237265886. Memo: API Payment. ELLAOS LTD withdrawal transaction. 11.26.18 19:11	Account	Receive	+5.00	Received Payment 5.00 USD from account U18384461 to account U4731311. Batch: 237372446. Memo: API Payment. ELLAOS LTD withdrawal transaction. Memo : Shopping Cart Payment. ELLAOS.com deposit transaction. 11.27.18 19:16	Account	Receive	+5.00	Received Payment 5.00 USD from account U18384461 to account U4731311. Batch: 237488407. Memo: API Payment. ELLAOS LTD withdrawal transaction. Memo : API Payment. ELLAOS LTD withdrawal transaction. 11.29.18 17:45	Account	Receive	+5.00	Received Payment 5.00 USD from account U18384461 to account U4731311. Batch: 237700629. Memo: API Payment. ELLAOS LTD withdrawal transaction.